• Rise of any ramp is limited to ≤ 2′-6″. 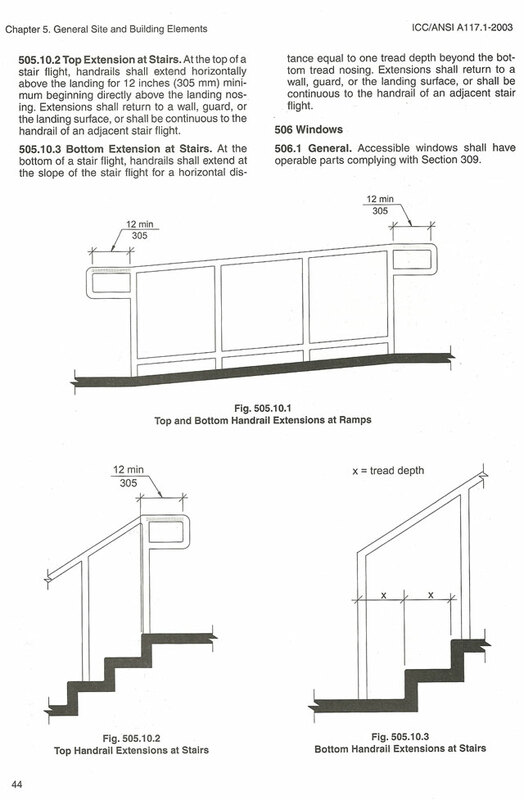 • The width required for a means of egress ramp is the same as that required for corridors. 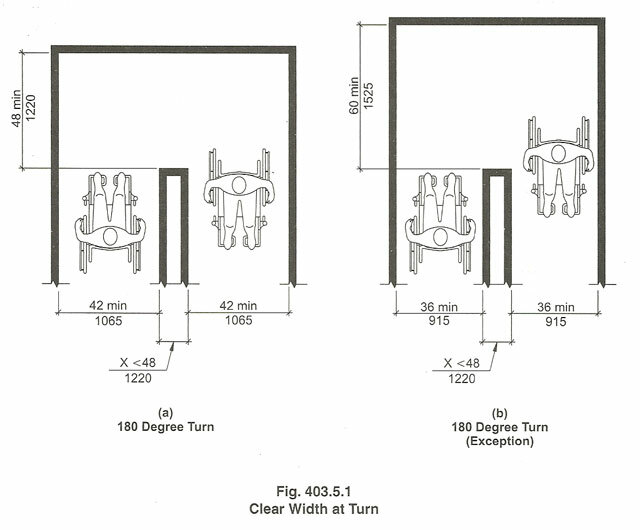 Note: 1018.2, “Corridor width,” is cited as the source governing applicable widths. ◦ Between permissible projections into the ramp width. Egress Ramp with Turn. Source: ANSI 117.1 2003 p 16. 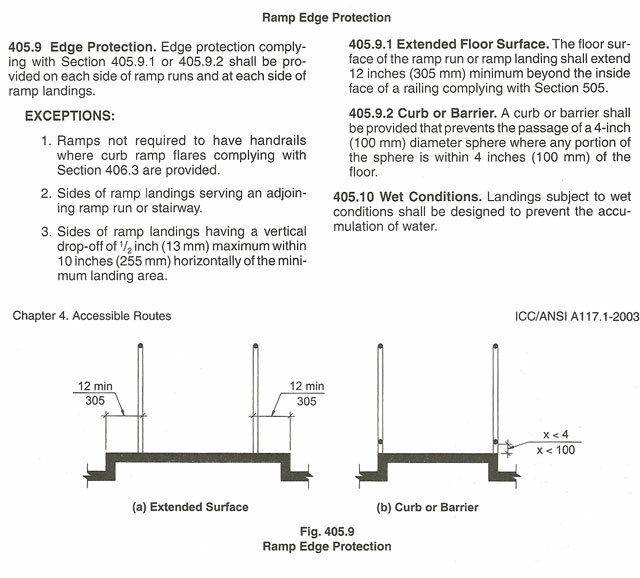 • Headroom required for all parts of a ramp in a means of egress is ≥ 6′-8″. ◦ Width may not reduce in direction of egress travel. ◦ Projections are not permitted into required width of ramps and landings. ◦ Door swing onto a landing must leave ≥ 3′-6″ clear width unobstructed. ◦ At changes of direction. 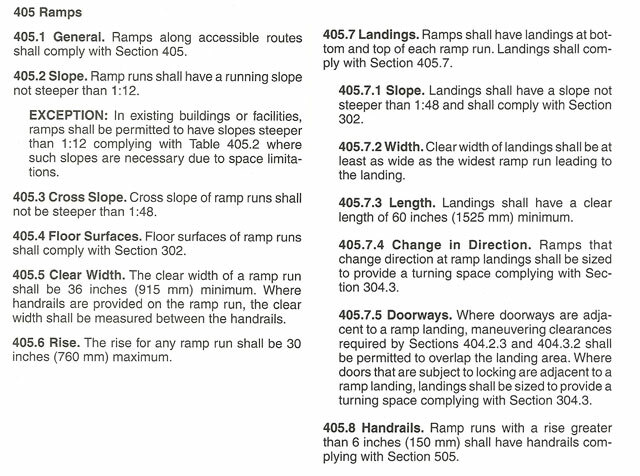 Note: 1010.6.1, “Slope,” through 1010.6.5, “Doorways,” are cited as governing landings. Source: ANSI 117.1 2003 p 23. • Changes of level on a ramp landing are not permitted. • Ramp landings may not slope ≥ 1:48 in any direction. • The width of a landing must be ≥ the width of adjoining ramps. In R-2 Occupancy Types and R-3 Occupancy Types where not required to be Accessible, Type A or Type B units. Note: Section 1107, “Dwelling Units and Sleeping Units,” is cited as governing these facilities. Landing length is not required to be > 4′. ◦ Landing length must be ≥ 5′ in other locations. 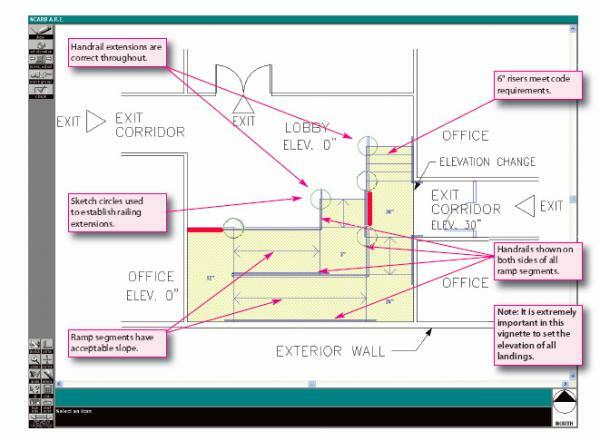 Note: ICC A117.1, “Accessible and Usable Buildings and Facilities,” is cited as governing curb ramps. Not providing an accessible route. Not serving accessible parking spaces. Not serving other accessible elements. Not part of an accessible means of egress. ◦ Ramps used in a means of egress. ◦ Assembly areas accessory to Occupancy E.
Note: 1028.11, “Assembly aisle walking surfaces,” is cited as governing aisle ramp slope. ◦ Ramps in a means of egress must have a slope ≤ 1:12. ◦ Other pedestrian ramps must have a slope ≤ 1:8.